Decided to go for a lunchtime bike ride today with the usual bunch of bikers from work. We rode for about 14 miles taking in Swansea Marina, SA1, Liberty Stadium and Fendrod lake – basically following National Cycle Route 43. Along the way we crossed the Trafalgar bridge, Sail bridge and Beaufort Reach bridge. I just can’t seem to get away from mentioning bridges on my blog at the moment! I think I’m in denial now. The ride was a good one, although a lot easier than the usual lunchtime jaunt which usually includes a rather tough hill climb somewhere along the way. Having said that, my good old friend Johnny Wind (no not that wind) made it hard work in some of the more open spaces. Still an enjoyable hour or so away from the office, so I’m not complaining. 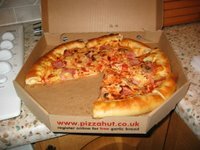 The DDWT family dined out at pizza hut tonight (in the Morfa retail park), which wouldn’t normally warrant a mention, but I couldn’t help but laugh when Mrs. DDWT had an argument with another punter over the ownership of a pizza ‘doggy bag’ whilst we were leaving. It was like a scene from a panto at the Grand Theatre in Swansea – “That’s my pizza box”, “Oh no it isn’t its mine”, etc, etc. To cut a long but funny story short, it transpires that punter no. 1 (i.e. my wife) has 7 pizza slices in the box and punter no.2 (greedy bugger) only had 3 pizza slices in her box. Phew, the lengths people go to these days for some extra pizza LOL. To mark such a momentous (and bizarre) occasion, below is a picture of said pizza!